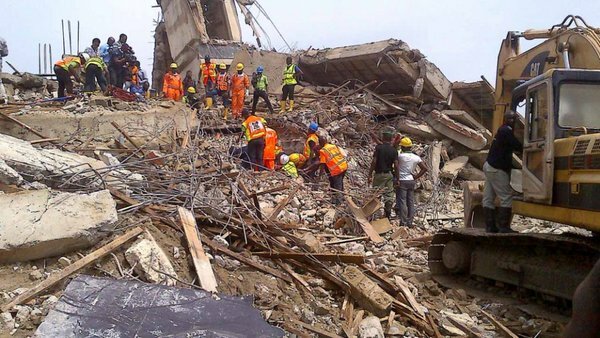 18 ,including a woman and her child have been confirmed dead after a five-storey building under construction collapsed early yesterday in Lekki, Lagos. NEMA SouthWest media coordinator Ibrahim Farinloye confirmed the death toll and the number of those rescued. The incident occurred at Horizon 1, Lekki Gardens in Ikate, at about 3am when it was raining heavily. Many workers believed to have been trapped in the building. It was learnt that the occupants were workers on the site and squatters who slept in the building after giving a tip to security men. Lekki Gardens, the owners of the building, claimed to have ordered stoppage of work in January at the site when it was discovered that substandard materials were being used. As at 4:30pm, bodies were still being retrieved from the building. Residents of the area were assisting emergency workers.Some of the victims are Beninoise. It was also learnt that a woman and her two children who came to Nigeria on Monday from Cotonou were among those who remained trapped in the rubble last night. The woman was said to have travelled to Lagos since her husband had not visited the family for some time..According to an iron bender, Fidelis Anjolo, the woman did not believe her husband’s story that he was being owed as a result of which he could not travel back to see his family. An artisan, Mathew Ademola, who claimed that seven Beniniose were brought to work on Monday evening, said they were missing.He said a food vendor simply identified as Hauwa remained unaccounted for. A resident of the area, Remi, said she was searching for her brother Femi. The disturbed woman said his number was not going through. She said: “My brother is a bricklayer. He lives in Alagbado (on the outskirts of Lagos) with his wife and children but could not afford to be going home everyday because of the transport cost. A carpenter, Mutiu Gani, said he and some of his friends pay security men to sleep in the building at night, adding that four of his friends were trapped. An interior decorator blamed those handling the estate for underpaying workers, adding that he was owed N317,000. “I have slept under the sun and in the rain as well as suffered mosquito bites. I sold my power bank to raise transport fare to this site on Monday so that I can get my money, but they have not paid me,” he said.